What appears to be an explosive invasion of tiny black orbs is actually one small part of the solution to Los Angeles’ four-year drought. 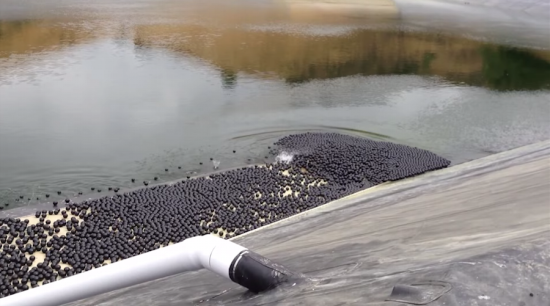 Colloquially called “shade balls,” these 36 cent buoyant spheres are a part of a $34.5 million water quality protection project by the Los Angeles Department of Water and Power (LADWP). The 4-inch-diameter polyethylene balls, produced by California startup XavierC, help slow evaporation and are chemically coated to block ultraviolet rays that can potentially cause a chemical reaction that could produce the cancer-causing chemical bromate. The hollow, water filled plastic spheres are expected to save 300 million gallons of water annually, enough to quench the thirst of 8,100 individuals a year.